Sometimes I come across things in our archives that I think look interesting, but I don’t know a lot about them. 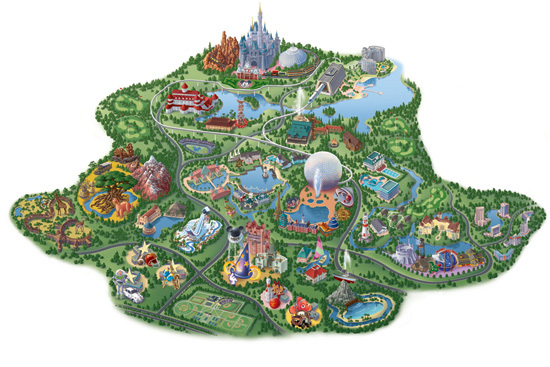 Such was the case with the following map. Turns out, my friends at the Walt Disney Archives knew plenty. In the early years of Walt Disney World Resort, this artwork decorated the guest rooms of the Contemporary Resort Hotel and the Polynesian Village Resort Hotel. 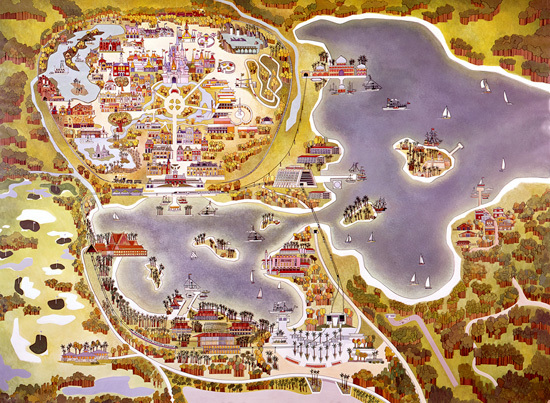 The piece showcases the spirit and vast, all-new offerings of the “Vacation Kingdom of the World,” including Magic Kingdom Park, golf courses, beaches, watercraft, monorail transportation, Bay Lake and its eventual Discovery Island, Fort Wilderness and Tri-Circle-D Ranch, STOLport, the Polynesian and Contemporary Resort hotels, and three “future” resorts: the Asian, Venetian, and Persian. As Disney legend goes, because so many of the original Walt Disney World Resort maps were printed for guest rooms, a cast member used the excess ones as wrapping paper for Christmas presents one year. Steven Miller, did you read that? Not a bad idea.